the possibilities of technology by using it to address global challenges. Technology allows us to ask previously unimaginable questions and find solutions to unsolved problems. IEEE Smart Village (ISV) empowers more than 150,000 people in more than 100 villages around the world. One particular project in 2017 clearly targets the three pillars of ISV: Social Enterprise, Education and Access. The Shakti Empowerment Solutions Pvt Ltd projects combine community education with entrepreneurial business opportunities to provide rural villagers with access to clean energy and education, creating a blueprint for a scalable rollout to 10 villages in five years and transforming 41 communities by 2027. The solar energy enterprise powers households, small commercial beneficiaries and community resources such as a water purification plant, impacting approximately 150 families. The education program provides village members with access to classes held in a community center with reliable electricity and internet connectivity. Igniting Africa’s “Bright Village” solar energy program provides life-transforming energy in three villages in North West Cameroon (west Africa). Before the advent of reliable and continuous power in these communities, life was tough for villagers, especially small market business owners and youth. In the villages, barbering was done with hand sheers and razor blades; those who didn’t like a haircut with scissors had to travel to the nearest town with grid electricity, which was a three-hour or more walk away. Today, all three villages have hair care salons using electric clippers, creating employment for seven young barbers and beauticians. The lives of these young Cameroonians have now been made more meaningful thanks to the presence of reliable solar power in their communities. The solar power plants of Igniting Africa serve as training grounds for students of the Igniting Africa School of Humanitarian Entrepreneurship and students from local universities that don’t have electricity laboratories. At the power station, students from poor, rural communities learn about the systems and capabilities that are most needed in their community, like home wiring, solar installation and maintenance, solar water pumping and irrigation, and energy entrepreneurship. This tuition-free, work-study training program makes education accessible to the rural poor. As Igniting Africa’s solar stations are managed by the graduates, the solar stations offer them direct job opportunities. Previously, village shops would close by 6 pm due to the lack of lighting. Since the arrival of solar power, however, shops now operate up until 10 pm, which has led to increased sales and income for shop owners. Villagers now stay around the market square into the night, which has added a new and different social dynamic to village life. National Geographic’s Breakthrough Episode – Power to the People. 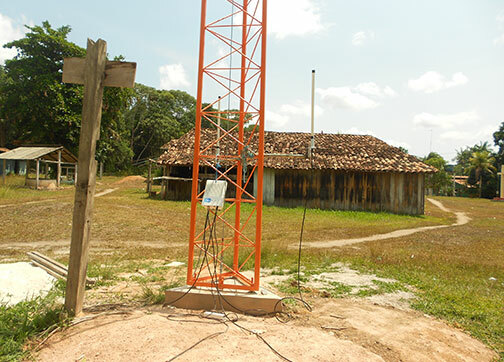 IEEE volunteers to bring power to remote communities. 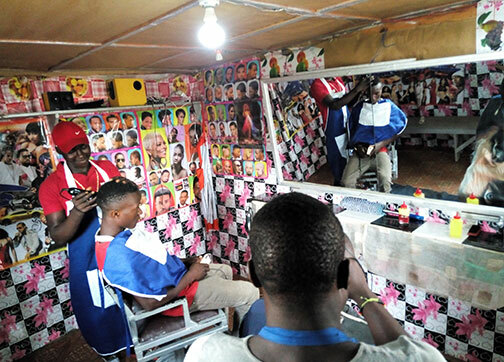 Thanks to the AC power now provided by Bright Village (a seed-funded program of Smart Village) this haircut salon in the village of Illung, Cameroon has an active clientele 6 days a week. The business, established by a local Catholic Priest from India in service to the community, is one of several humanitarian endeavors and small business start-ups he is funding now thanks to Bright Village power. IEEE Smart Village was a finalist in the United Nations Department of Economic and Social Affairs “Powering the Future We Want Energy Grant.“ The 2017 theme was: “Sustainable Energy for Eradicating Poverty and Promoting Prosperity in a Changing World. 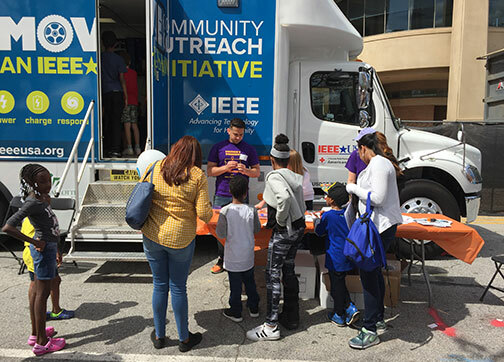 2017 was a busy year for the IEEE-USA Mobile Outreach Vehicle (MOVE) team. After providing support to victims of flooding in Missouri, US in May, the team deployed continuously for disaster relief efforts from mid-August through October. When not deployed for disaster relief efforts, the team worked to support STEM and community outreach events that notably included the Atlanta Science Festival and The National Scout Jamboree. In the last quarter of 2017, the MOVE team assisted with communication outages caused by overuse during the eclipse event, followed by a marathon chain of deployments to Houston, TX, US for Hurricane Harvey Relief as well as to Florida, US (specifically Naples and Key West) to assist victims of Hurricane Irma. On 26 August 2017 Hurricane Harvey made landfall as a Category 4 storm with sustained winds of 130 mph. 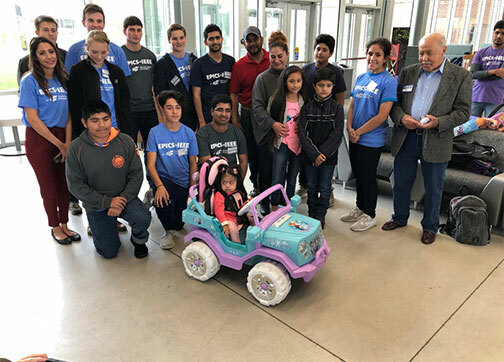 Traveling 1,357 miles, IEEE MOVE volunteers arrived at 10 pm CDT during torrential downpours at the George R. Brown Convention Center in Houston, TX, US. After spending the night in the MOVE truck, the team set up communications infrastructure for first responders and assisted the mega shelter in preparing for the arrival of more than 10,000 displaced residents. Described by our volunteers as an area that “looked like a war zone,” buses and helicopters arrived to unload victims of the devastation and our volunteers were onsite to assist with immediate relief needs and ongoing recovery. The weather situation was quite volatile in Houston and volunteers were evacuated into the building three times in just one hour due to tornado warnings. Once it was deemed safe, however, the real work began — setting up back-up communications (ham radios) and providing all of the information technology required to support the many programs in operation at this mega shelter, which included activities related to feeding, sleeping, medical and mental health care, management of volunteers and resources on site, family re-unification and more. Rescue and recovery efforts continued — as did the heavy rain — until 30 August. On the 28th, water quickly rose around the truck at 12:30 am, but thanks to Tim Forrest, one of our most active IEEE volunteers, the crisis was averted and the team was able to move the vehicle before it too was flooded. Another threat was looming in Florida with Hurricane Irma. On 6 September, a new crew arrived in Houston to continue supporting recovery operations as the MOVE truck and its volunteers headed to Florida, US to provide relief efforts there. 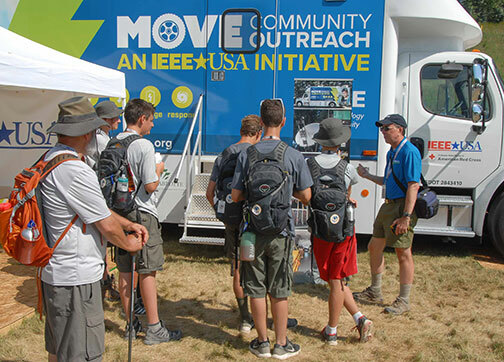 IEEE-USA’s Community Outreach Initiative – The MOVE Project was an integral part of the 2017 National Scout Jamboree and provided STEM activities for the 30,000 visitors. The MOVE vehicle was on site from 18 – 25 July. IEEE Volunteer Jay Diepenbrock illustrated MOVE truck equipment and its applications. Also, the IEEE emeritbadges.org STEM program helped scouts earn their Electricity Merit Badge and the Electronics Merit Badges. 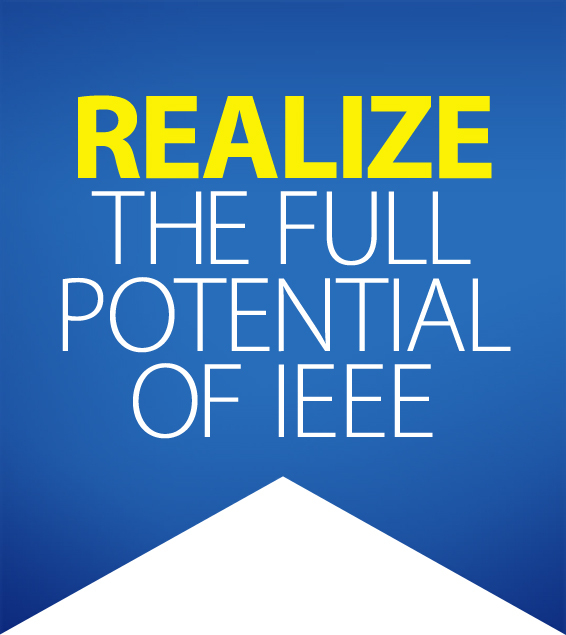 STEM Outreach is a major mission of IEEE MOVE. IEEE volunteers had a great day on 24 May 2017 at the Atlanta Science Festival’s Exploration Expo. 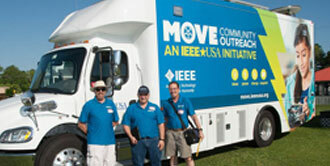 Nearly 500 people toured both the IEEE MOVE TRUCK and the IEEE Atlanta Section display. Humanoid robot ‘KEN’ was onboard all day and was a huge hit with both students and adults. 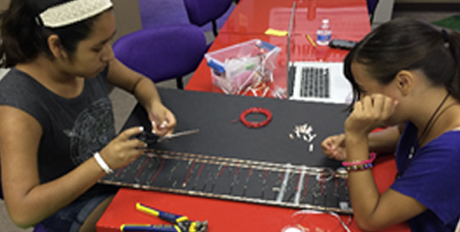 IEEE also sponsored the Curious Kids Zone, which included the IEEE Atlanta Section’s Engineers Workshop.